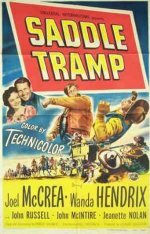 An engaging western starring the laconic Joel McCrea as a cowboy who takes care of four orphaned children, trying to keep them a secret from his child-hating boss. It was made as a family film, but director Hugo Fregonese manages to avoid sentimentality - no mean feat given the nature of the material. The Technicolor location photography by Charles Boyle is particularly attractive, and Wanda Hendrix (Mrs Audie Murphy at the time) makes a perky heroine. A very appealing and charming film.